From programs to counteract identity theft to inspections of imported seafood to storage of military clothing, federal agencies continue to duplicate one another’s efforts and miss out on potential efficiencies, Congress’s watchdog reported on Thursday. The Government Accountability Office, in its eighth annual report on “Additional Opportunities to Reduce Fragmentation, Overlap, and Duplication and Achieve Other Financial Benefits,” laid out 68 new actions in 23 areas for potential improvement. The savings identified since the reports began in 2011 are as high as $178 billion, the watchdog said. Comptroller General Gene Dodaro, however, told a hearing of the House Oversight and Government Reform Committee that agencies are not capitalizing on these savings opportunities. Forty-one percent of GAO’s recommendations over the years have not been fully implemented, he said. “My goal was 75 percent if not 100 percent” fulfillment of recommended actions by agencies or Congress, Dodaro said. Some of the recommendations could “increase revenue coming into the government” at agencies such as the Internal Revenue Service and the Centers for Medicare and Medicaid Services. GAO has added 13 new areas of duplication and 10 new areas to monitor in its “action tracker,” the report said, citing examples in improper payments and tax fraud. The agencies with the highest number of open recommendations are the Defense Department, the Health and Human Services Department and the IRS. The duplication report released a year ago contained many similar items, but was framed in the context of the new Trump administration’s plans for agency reorganization. Those plans are now due out in May. Examples of duplicative programs included the Pentagon’s distribution centers for storage and processing of goods for troop support, such as clothing and weapons system spare parts. Less overlap in those programs could potentially save $527 million over five years, GAO found. The IRS and CMS could save money by strengthening controls over the $35 billion premium tax credit for health insurance under Obamacare, GAO said. And the Office of Management and Budget “should explore options to address the risk that federal agencies may offer duplicative identity theft services,” the latest report noted. 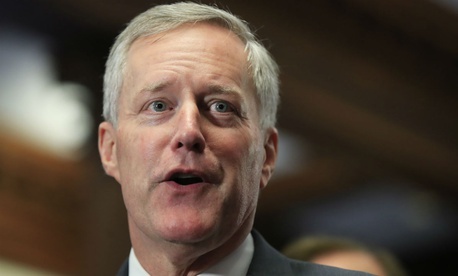 Rep. Mark Meadows, R-N.C., at the hearing praised GAO for its unbiased assessment. “I’ve wanted you to be partisan but you pushed back,” he said.